Recommended to: Readers who enjoy fairy tale retellings, mashed with a bit of science fiction! It is true that I am drawn to the retelling of fairy tales in an almost magnetic fashion. There is something about taking some that has been hashed and rehashed so many times, and still finding the ability to add something new, that makes me smile. That is why when I found out about Cinder, it instantly rose to the top of my reading list. What Marissa Meyer has done with the story of Cinderella is truly magical. Take a story about a fairy tale princess, add in cyborgs, androids and alien races, and you have a book that captured my imagination. Is it steampunk? Is it a fairy tale? I think it's both. At the heart of everything is the basic story line of the original fairy tale. Cinder is a character that was orphaned, and is now being raised by her stepmother and stepsisters. She does in fact do the majority of the work around the house, as well as running the family business to bring in money. However, that's where most of the blatant similarities end. In Meyer's story our princess is anything but a wilting flower. Cinder is tough. She's stubborn and willing to work hard for what she wants. She's witty, and her charisma flows off the page. In fact, Cinder has no idea at all that she is a princess. To her, life is all about working hard for her dream. Nothing else matters. That is, until Prince Kai comes along. Oh, Kai. I swoon for this gorgeously portrayed prince. If ever there were a princely figure to fall in love with, it would be him. Kai is young, and being pushed into becoming emperor sooner than he'd like. However he takes it all in stride and so graciously. Even when Meyer mentions his worry, Kai finds a place in himself that he draws a smile from. He is the type of character that it is entirely impossible not to fall in love with. Paired with Cinder, the two of them have amazing synergy. The world that Cinder and Kai inhabit is beautifully rendered and immersive. Although there are ties to our current Earth, things on their world are still vastly different. Androids are a commonplace part of daily society. Lunars, or the society of people who come from the moon, are in terse negotiations with the people of Earth. Everything is so new and fresh. The one thing that boggled my mind was simply why Cinder was so afraid of people finding out that she was a Cyborg. I kind of hoped that at this point in society people would be accepting of them. Still, it's likely an important part of the story that just hasn't been revealed yet. I believe it. Cinder is a complicated character, and I love her for it. Although the first half of the book was a little slow for me, I soon became intensely invested in Cinder and Kai's story. Marissa Meyer has created something amazing with this retelling. 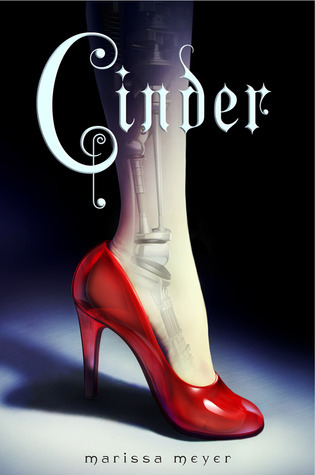 If you too are a fan of the retelling of fairy tales, give Cinder the top spot on your reading list! If this is the first time you're delving into this part of fiction, this book is a great place to start. Part steampunk. Part science fiction. All fairy tale romance. Cinder is a wonderful book, and I cannot wait for more!